Prime Minister Manmohan Singh categorically said today that India’s stand on the Iran nuclear issue at the Board of Governors meeting of the International Atomic Energy Agency in Vienna tomorrow will depend on the draft resolution and in keeping with “our enlightened national interest.” He declared there was “no question of bending” on the Indo-US nuclear cooperation in the peaceful uses of nuclear energy. 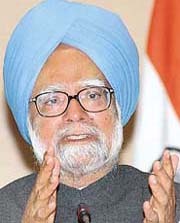 Prime Minister Manmohan Singh addresses a press conference in New Delhi on Wednesday. Do you approve of the decision to refer Iran's nuclear programme to the UN Security Council? Prime Minister Manmohan Singh today sent out a subtle message to the United States when he publicly stated, for the first time since the July 18 Indo-US nuclear agreement, that Russia and France were also keen on nuclear energy cooperation with India and set up nuclear power facilities here. 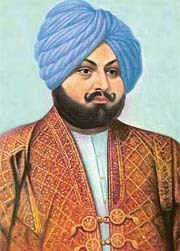 FOUNDER'S DAY: Sardar Dyal Singh Majithia founded The Tribune on this day 125 years ago. Prime Minister Manmohan Singh today defended his government’s decision to dissolve the Bihar Assembly by pointing that even the Supreme Court did not have one opinion on the issue. As employees of the Airport Authority of India all over the country went on a strike in protest against the privatisation of the Delhi and Mumbai airports, the government today threatened to invoke the Essential Services Maintenance Act to ensure smooth functioning of the airports. 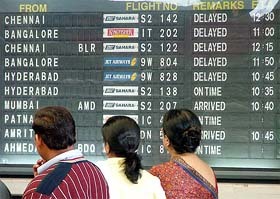 Passengers read the flight status board at Indira Gandhi International Airport in New Delhi on Wednesday. The controversial decision of the Union Government on privatisation of Delhi and Mumbai airports has been challenged in the Supreme Court even as the Cabinet today approved the awarding of the contracts to GMR-Fraport and GVK-South African Airports Consortia for modernisation of the two airports respectively. The Union Minister for Human Resource Development, Mr Arjun Singh, today assured the Directors of all six Indian Institutes of Management that if they amended their memoranda of association, the government would not oppose their overseas expansion plans. Janata Dal (Secular) leader H.D. Kumaraswamy cancelled his trip to New Delhi today to meet top Bharatiya Janata Party (BJP) leaders to discuss government formation on February 3. JD (S) sources said the trip had been cancelled after the High Court took up a petition challenging the Speaker’s decision to recognise him as leader of the JD(S) for hearing today. Tampering with the security arrangement for former US President Bill Clinton’s visit to the office of IT major Oracle in Hyderabad in March 2000 by a state police head constable has cost him his job as the Supreme Court has set aside the order for his reinstatement.